Its base area is approximately 13 acres ( 53,000 sq. meters ) , enough i hold the cathedrals of Florence Milan and St.Peters a, as well Westminster Abbey and St. Paul's . The sides if its vase are lined up almost exactly with the cardinal points of the compass , The average discrepancy of alignment is only .06% . The length of the sides of the base vary within 0.08% accuracy limit . The degrees of accuracy , in orientation towards the cardinal points , keeping the base square and the perfection of the four sloping sides , are incredible , considering the size of the structure. The angle of elevation of 51 ْ50'35 " , expresses the transcendental number Z with very considerable precision , This particular angle yields the unique geometrical property that the ratio of the pyramids perimeter to its height is equal to 2Z where Z is the transcendental number 3.141. Some people insisted that this geometrical relationship had to be accidental . They claim hat the builder of the pyramids laid out its dimensions by rolling a drum along the ground . There is no evidence whatever that the Egyptians ever measured anything by rolling by a drum . The Egyptians laid out their temples by a well-known and often depicted method called "stretching the cord " . Any logical person cannot expect that such an imaginary drum just happened to stop rolling at 377' (115m) , which is the center of the Great Pyramid . And nobody could except such a rolling drum to yield dimensions within a few millimeters of accuracy , 1/8 of one degree of the earth's latitude a at the equator . 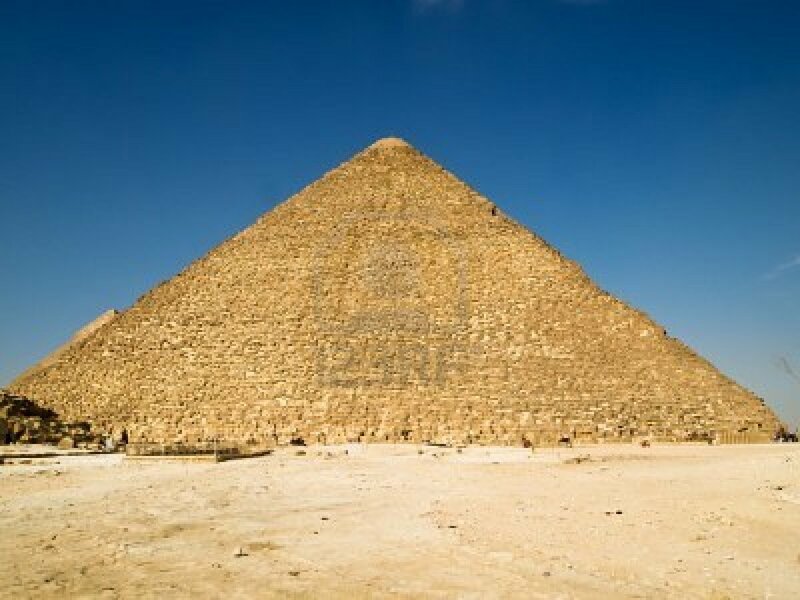 1 - The Pyramid acts as an enormous sundial . Its Shadow to the north , and it's reflected sunlight to the south , annually marked solstices ( long est and shortest days in the year) , and equinoxes ( days of equal day / night ) very accurately . a - It's apex represented the pole and the perimeter that the ratio of the perimeter to the height is equal to (2* Z) . 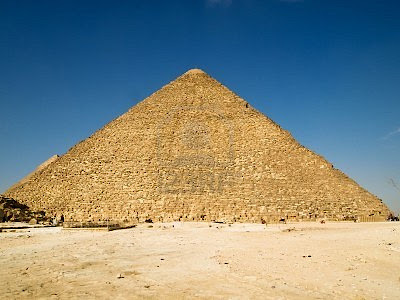 b- The Great Pyramid represents the northern hemisphere , to a scale of 1:43,200 . This scale , for the northern hemisphere , represents in half of 86,400 . There are 86,400 seconds in 24 hours for both hemispheres . C - The very small discrepancies (of several inches over the 754-foot length (230m) of the base) ere deliberate . they were meant to incorporate into the Pyramid the "discrepancies" of the itself, which is the flatting of the earth's globe at the poles . 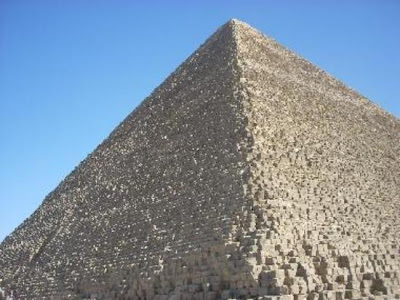 The pyramids as surrounding by and built partly upon a pavement it platform of limestone blocks. portions of which can be seen at the northern and eastern sides . The pyramid symbolizes the creative principle of geometry , mathematics , astronomy , and astrology . the interior of the building may have served as a temple of initiation where men rose towards God and God descended towards man .